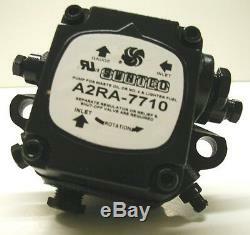 Brand New and Fresh Suntec A2RA 7710 Transfer Waste Oil Supply Pump. For Lanair, Reznor, Sunfire, Shenandoah, Clean Burn, WEDCO and others. 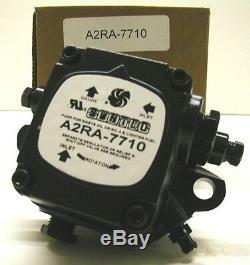 If your pump has A2RA 7710 on the label or stamped 7710 on the iron body, this is the correct pump for your application. This unit is Clockwise rotation when the shaft is pointing at you and the model numbers up. Unregulated output on both sides. 2 - 1/4" inlets, 2 - 1/8" output ports, unregulated. Can't find a pump you need? This is for Waste Oil Burner supply or transfer ONLY. We have many other parts. We will let you know if it is available. 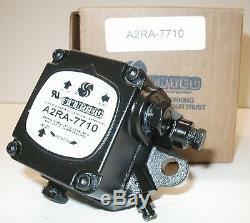 The item "Suntec A2RA 7710 New ONE YEAR WARRANTY Waste Oil Burner Pump, Reznor, Clean Burn" is in sale since Wednesday, November 14, 2012. This item is in the category "Business & Industrial\HVAC\HVAC Parts\Other HVAC Parts". The seller is "specialtyoilburnersupply" and is located in Hampton, New Hampshire.